Osaka, a widely popular destination for many, is famous for its modern architecture, intriguing nightlife and street side food like okonomiyaki, takoyaki and more. 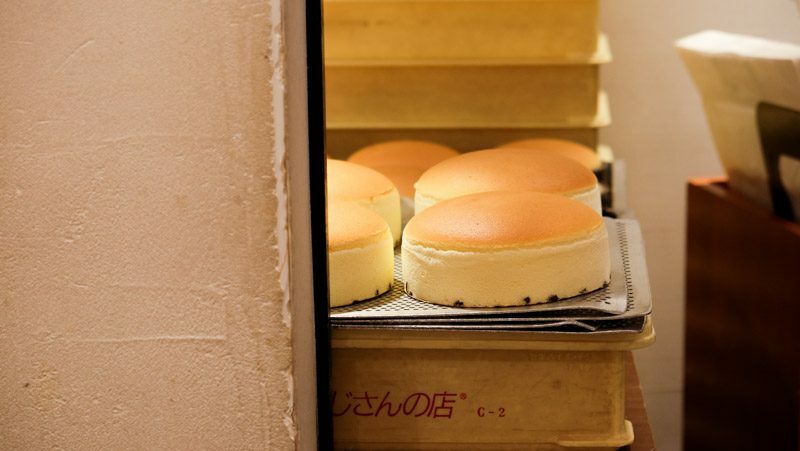 So here’s a list of Osaka eats while you’re there. I’ll be splitting this according to three different tourist-y areas in Osaka, and hope that it will help you navigate your tummies much more efficiently. They are namely Namba, which includes Shinsaibashi Suji and Dotonburi, Shinsekai, and last but not least, the 16th century shogunate Osaka Castle. Namba is considered the center of Minami (South) area of Osaka and is probably the most famous amongst tourists for their great eats all located around the corner. 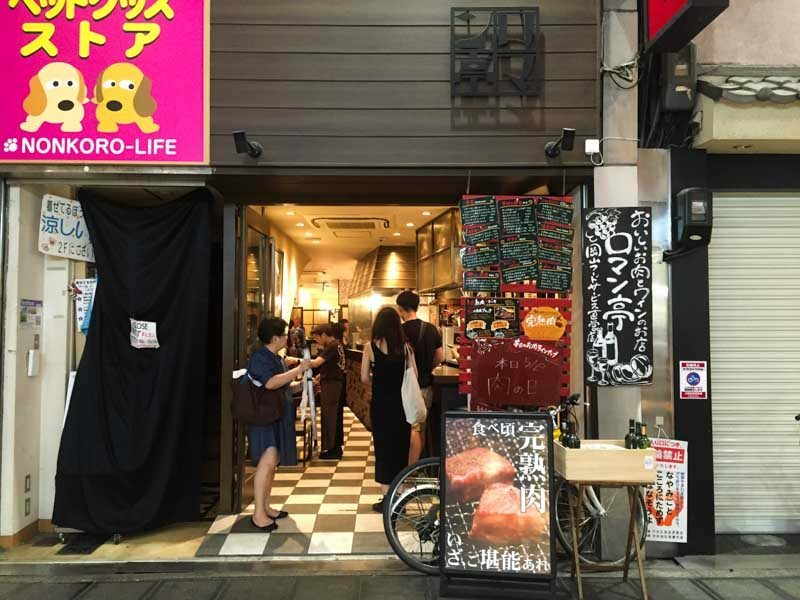 It is easily accessible with three subway lines connecting here, with hundreds of colorful neon lights and moving signboards in the Dotonburi and Shinsaibashi area. 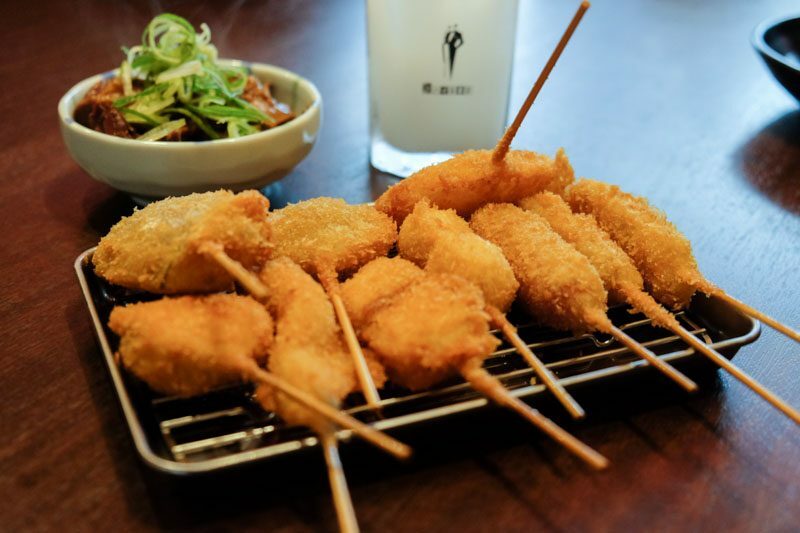 Located just around the corner from Bic Camera in Shinsaibashi Suji is a quaint and modest kushikatsu restaurant that offers up crisp skewers that are mouthwatering. 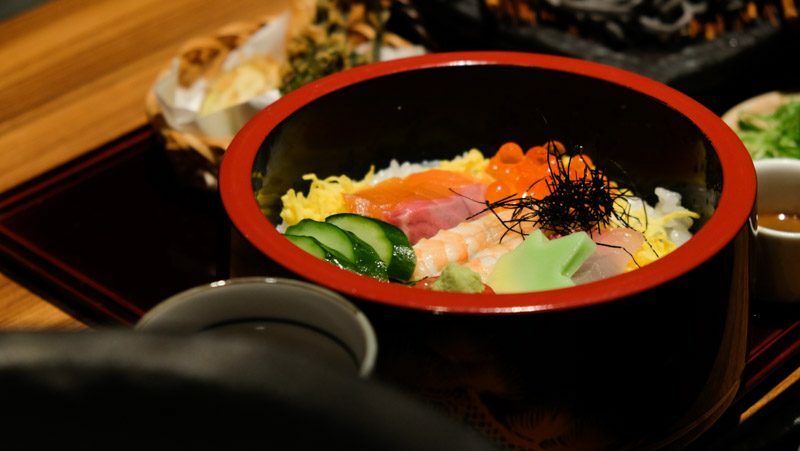 Upon entering, you’ll be greeted warmly by a whole crew of Japanese staff, and while they only speak in Japanese, they do stock an English menu, so you don’t have to worry about getting the wrong orders. Moriawase of 10 skewers (1400 yen). If you can’t decide on what to have, opt for its moriawase where you get to taste 10 assorted skewers, before deciding on your favourite and ordering more. 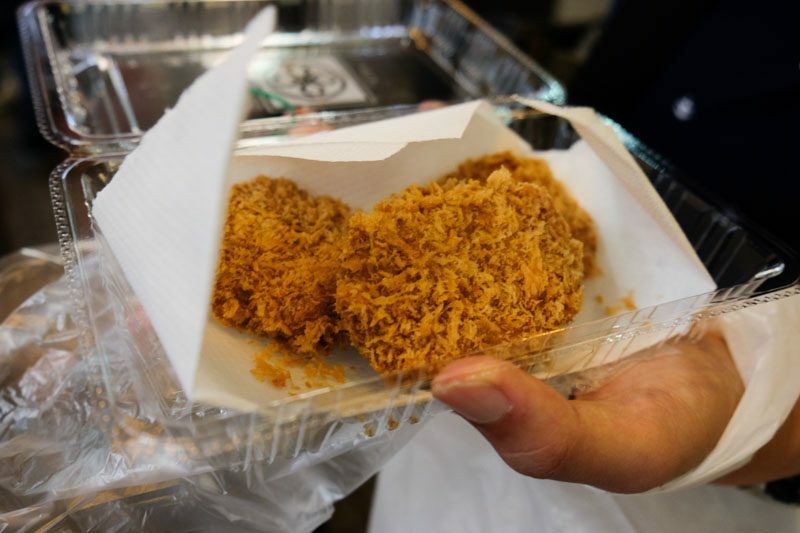 Do dip the kushikatsu with the sauce, which adds a slight sweetness to the overall flavour. Remember to never double dip, since it is a huge sharing pot. Try their special stewed beef, you have to! It is soft, tender and so rich in flavour, I couldn’t stop having them. Extremely heartening, finish up the sauce while you’re at it because it’s that amazing. It makes for a comforting dish, especially in the cold. And you know what? 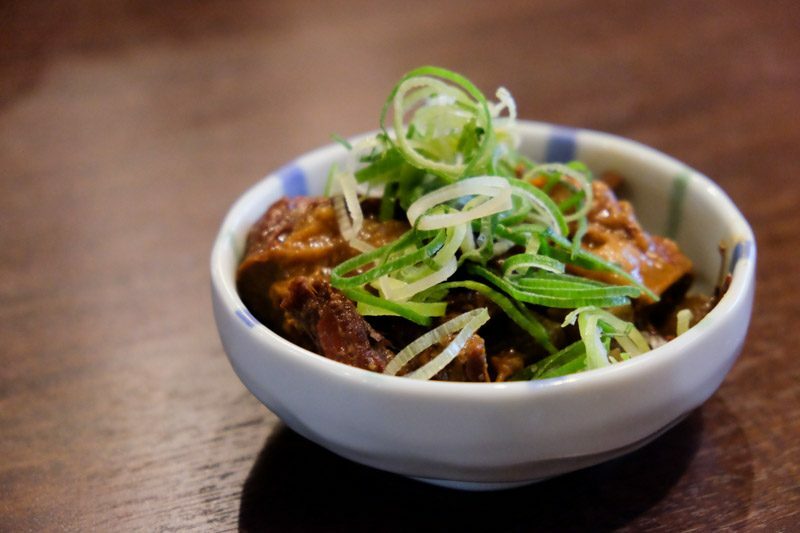 A sake with this dish never goes wrong. 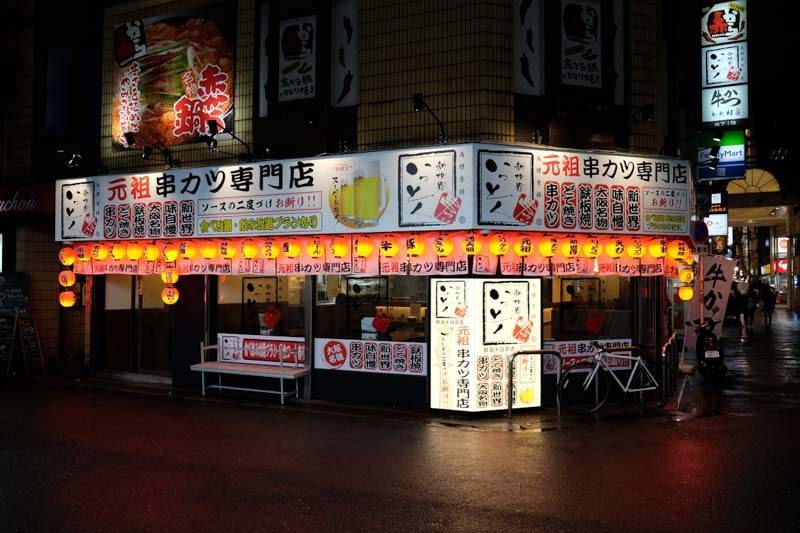 A 24hour ramen stall? I’m on it baby. 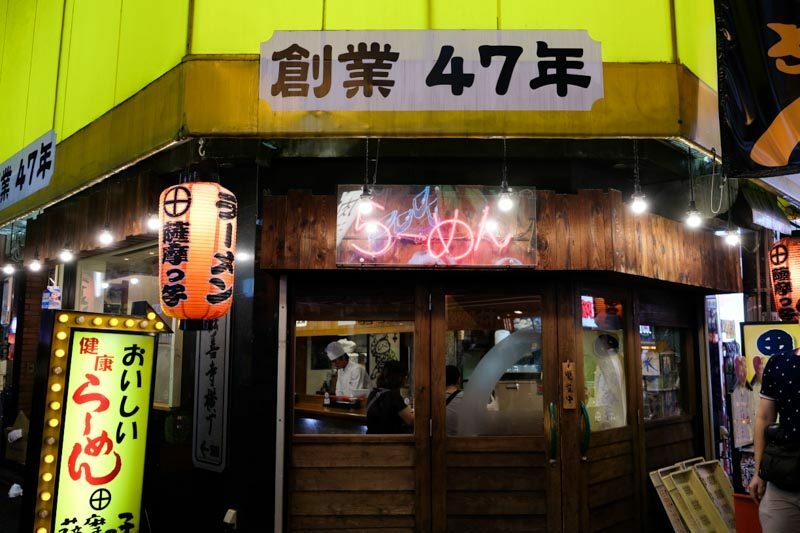 Along the ever popular Dotonburi area lies Hanamaruken Namba Houzenji. Yes I know, there’s Ichiran and many many more stores tempting you, but this unassuming ramen store has broth so rich you’ll be poor from eating too much of it. 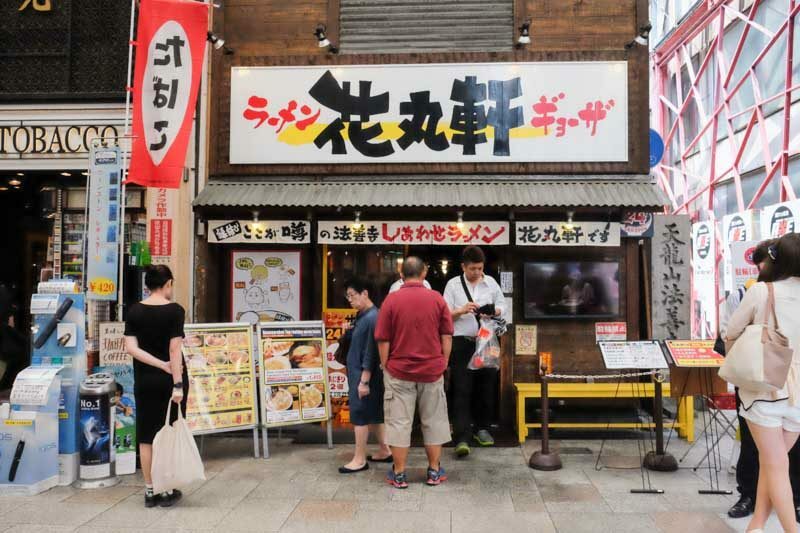 As with all Japanese stalls, they take pride in what they serve, they’d rather have one good dish on its menu than having 10 substandard ones. So yup, there’s only three choices of ramen available, namely the original, shio (salt) and charsiu (sliced bbq pork). 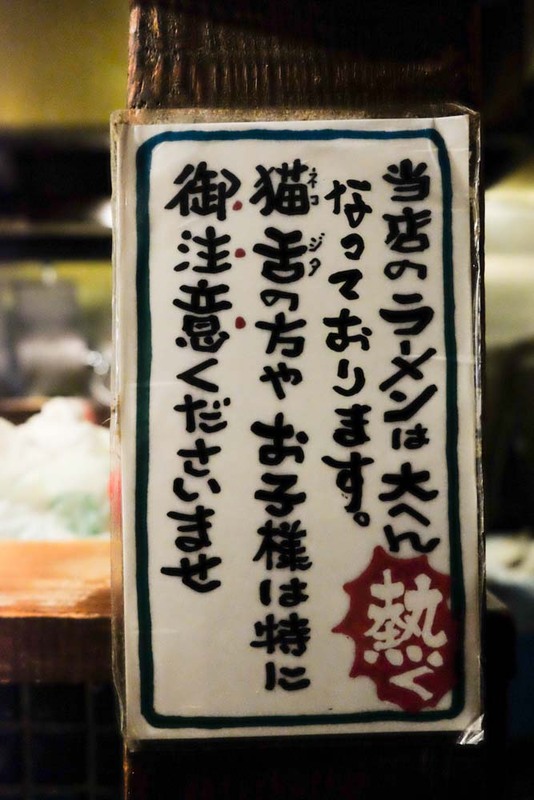 Its soup base is extremely hot, so please take caution when slurping, they even have a sign in store that warns everyone with a neko tongue (cat tongue – sensitive). They serve in-house fried ginger slices, which are super amazing to me. I was so close to finishing the whole pot, but had to refrain from doing so! If you’re not into the heavy and salty flavour then go for the original one instead. The broth is definitely comforting, which warmed my soul instantly, oddly reaffirming that the only ‘men’ I love is ramen. Concentrated but not cloying, the noodles are chewy. Plus, you get a free egg, yay. 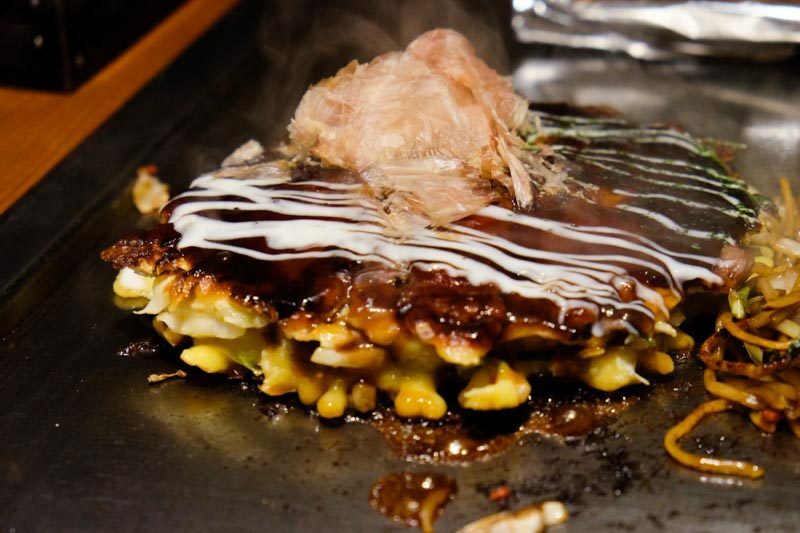 Osaka is known for their takoyaki, okonomiyaki and all streetside food, so you’re in for a treat when you’re sashaying down Dotonburi. 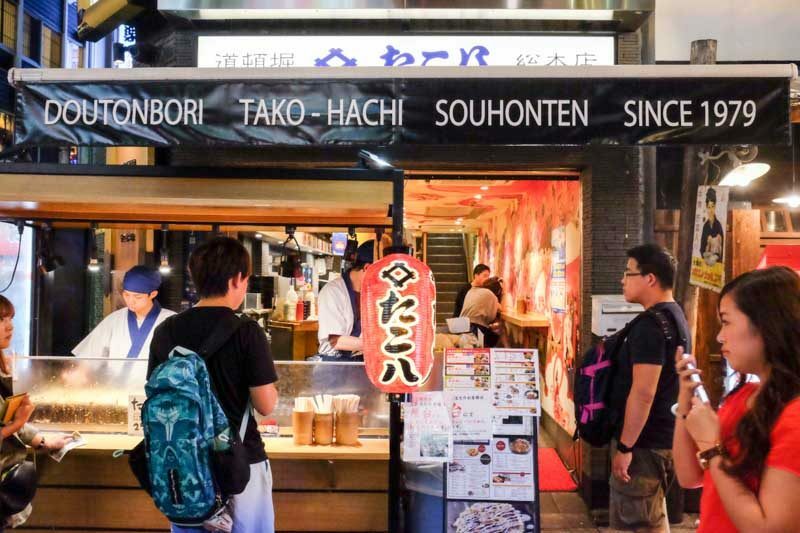 Hop into any branch and I’m pretty sure you’re sorted, but why not head to Tako Hachi Souhonten. 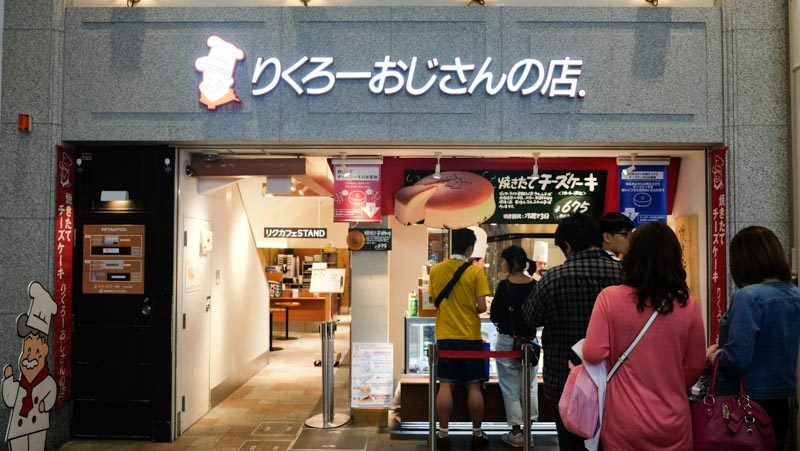 The restaurant is split into two sections, with the first floor being a casual takeaway place for you to quickly munch on the takoyaki you’ve just bought while the other floors are tables with their own cooking necessities for the okonomiyaki and so on. Tonpei, a type of omelette with tons of vegetable inside, glaced with sauce. 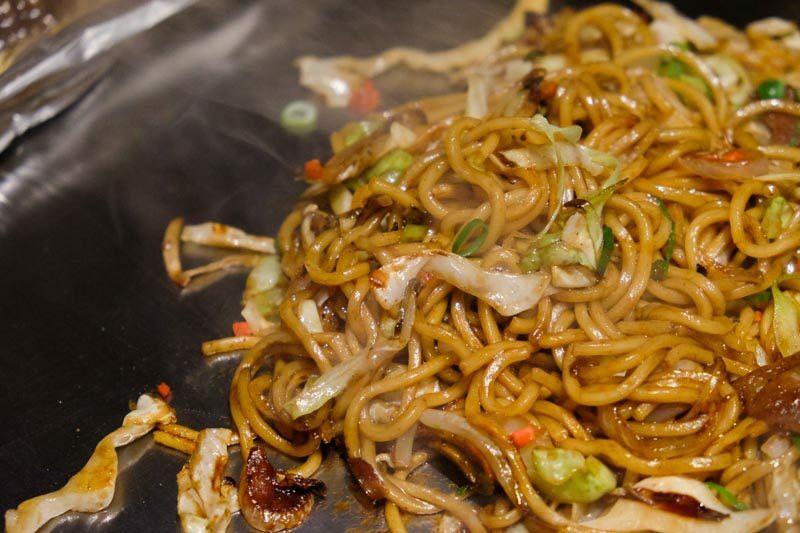 Yakisoba, nice and slightly sweet from the sauce. Definitely hearty. 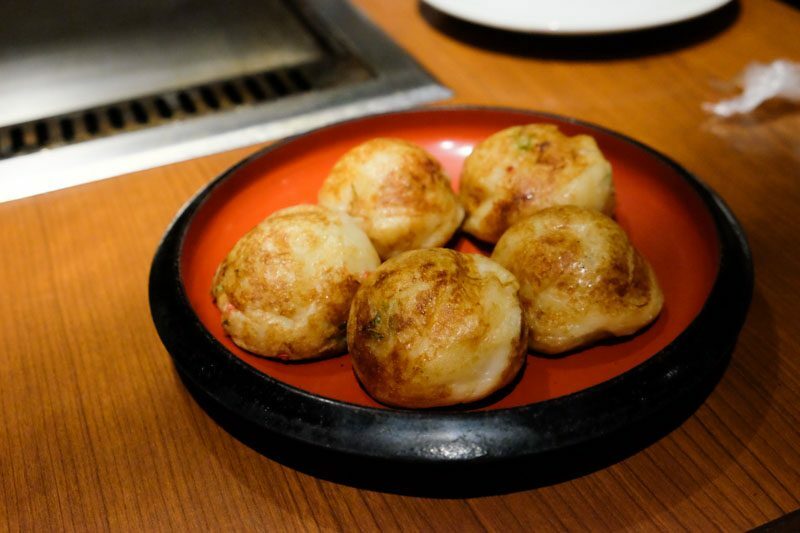 Takoyaki, super warm and while it is crisp outside, the batter is still runny and soft on the inside, making it velvety. Definitely much better than Singapore’s takoyaki that is outrageously dry. Now the standards are set and I’m almost sure I’m never having takoyaki in SIngapore ever again, damn it. 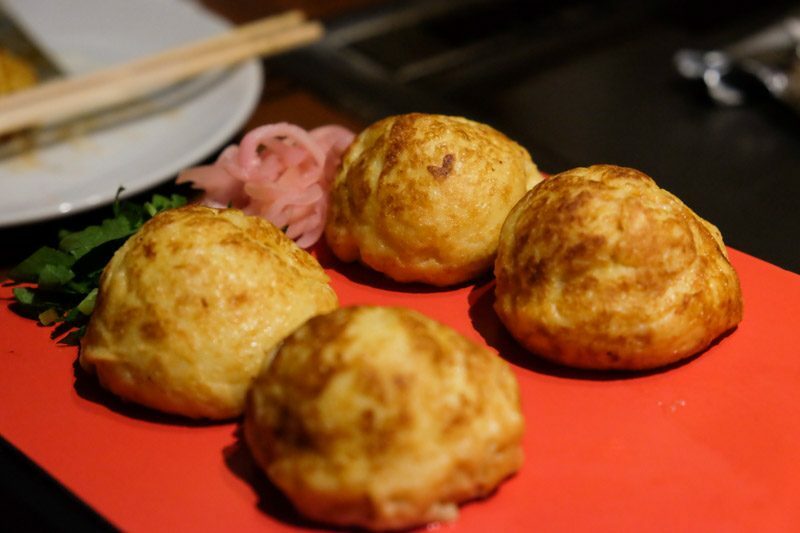 Akashiyaki, something special – think takoyaki but less flour and more egg in the batter, which makes it softer. 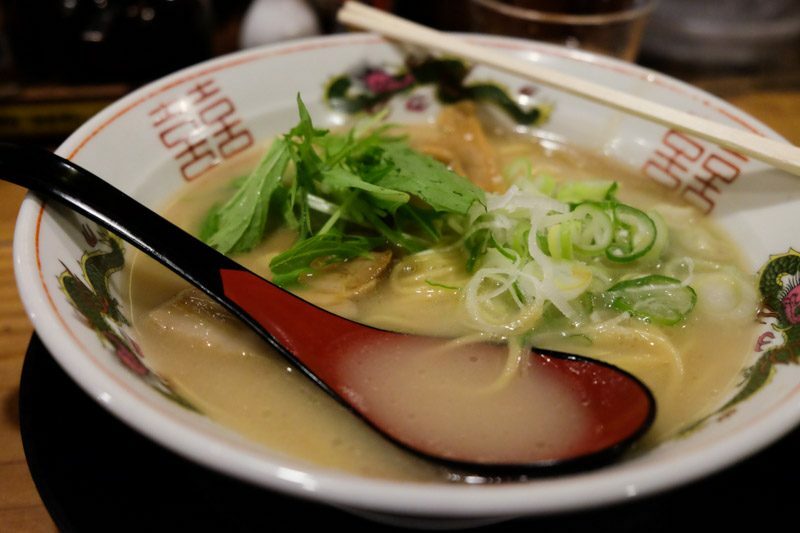 It Breaks away easily, so dunk it quickly into the dashi broth for added flavour and sweetness. Very, very luscious and definitely something I adore. 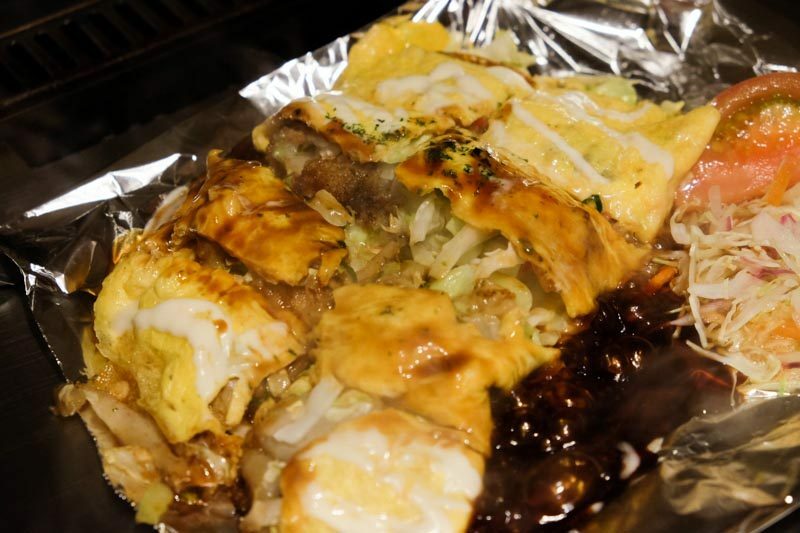 Okonomiyaki, basically a Japanese pancake enveloped with egg. 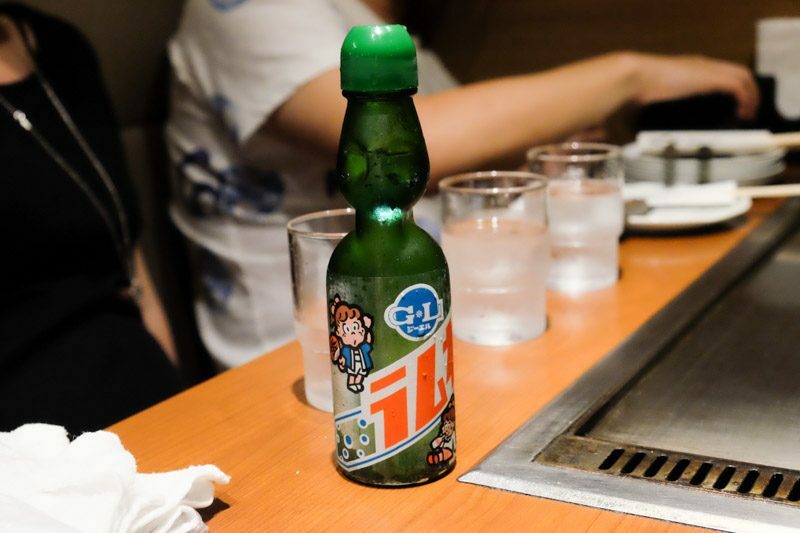 Oh oh, and get yourself a bottle of ramune (soda pop with marble), or a glass of yamazaki if you’re into the whisky thing. 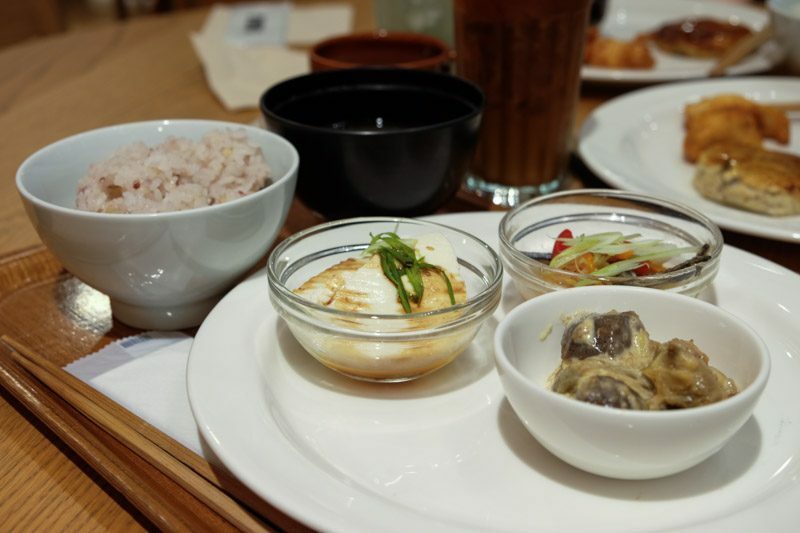 If you’re running low in cash and still want quality food, camp at Daimaru and head to their food basement level starting from 8pm onwards, because that’s when they are clearing their food and are usually offering crazy discounts on all their dishes. And yes, the quality is assured. Get lost in their crazily beautiful array of desserts where appearance is of utmost importance, or wile away in the freshness of their sushi. Either way, it’s a good way to spend your money. We had the katsu (4 pieces, 540 yen) and its aaaaaamazing. Marketing itself as healthy ramen, the dumplings (480 yen) that it carries is steamed and not like pan fried gyozas, which are refreshingly nice without discounting on flavour at all. It definitely gives a heartening warmth. 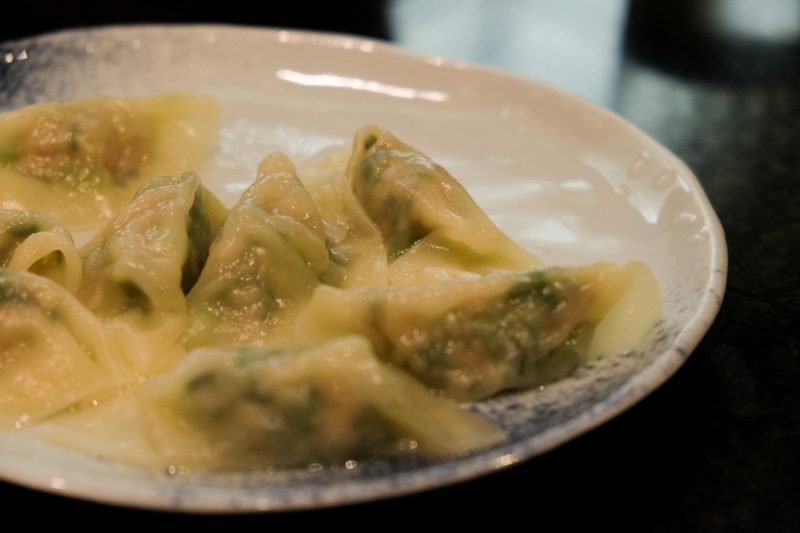 As the skin of the dumpling is extremely delicate, be careful when you are picking it up, you wouldn’t want wasting the juicy bits and broth. Combine it with the zesty vinegar, mmhm. They only serve two types of ramen, the original (950 yen) or the other with more char siew (1300 yen). 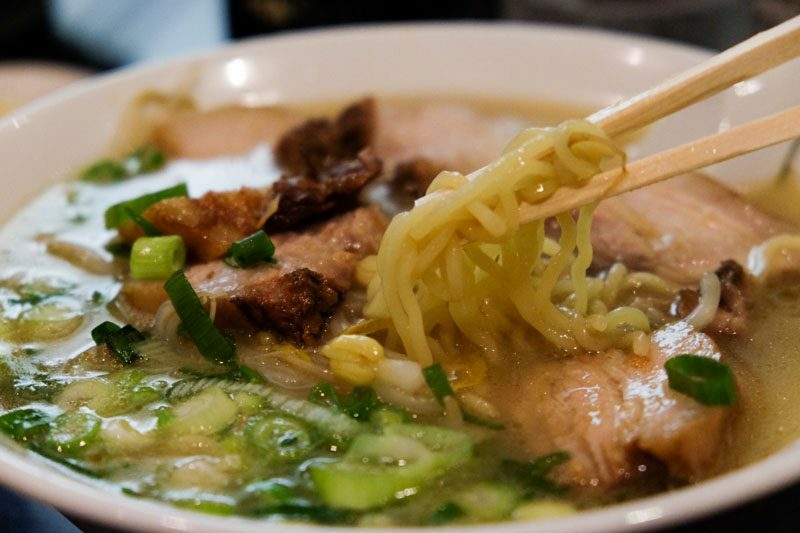 The ramen noodles are super bouncy and saturated with egg flavour that helps enhances the broth, making it sweeter. 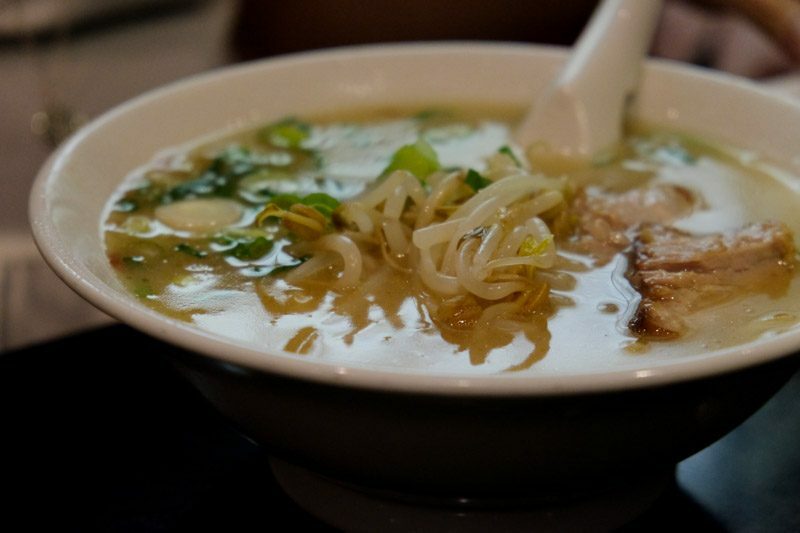 The broth is light yet comforting, unlike the usual thick and heartening type, which warms your soul like it should. Ah how can we ever miss out on the famous Pablo that gathers queues no matter the duration? I’d recommend going for the premium one, which is glazed instead of the layer of citrus fruit. I find the latter too contrasting in taste, with the zesty layer overpowering the cheese mousse and hence not being able to enjoy it wholly. Albeit tasting like a creme brulee, I personally prefer the glazed top. They also have seasonal flavours, so look out for it but be sure to get them early because they’re usually out of stock. Also, do yourself a flavour and get your hands on their pudding, which is nice, creamy, cold, slightly sweet and totally amazing. Made fresh at the shop, the cheesecake really wobbles. Extremely soft and spongy, it cuts away easily. Super fragrant, in contrast to the creamy Pablo but damn I love both of them. 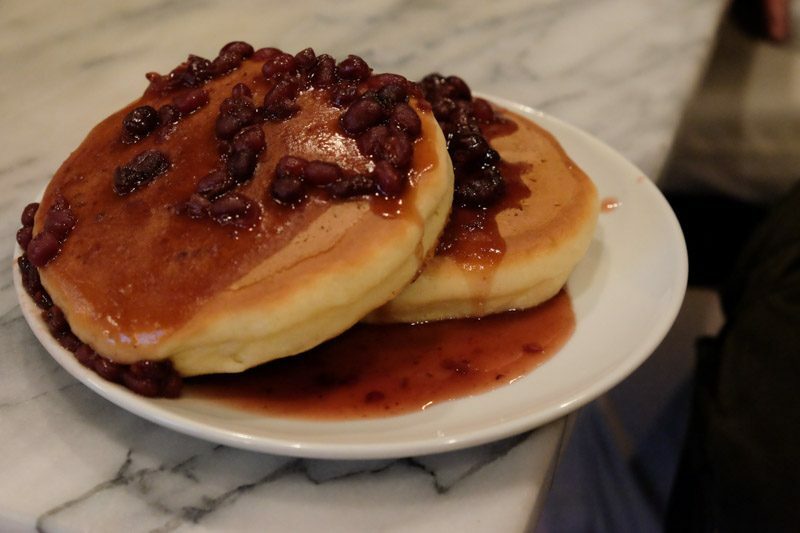 The layer of raisins at the bottom adds sweetness. Dare I say I’m also madly in love with their pudding? 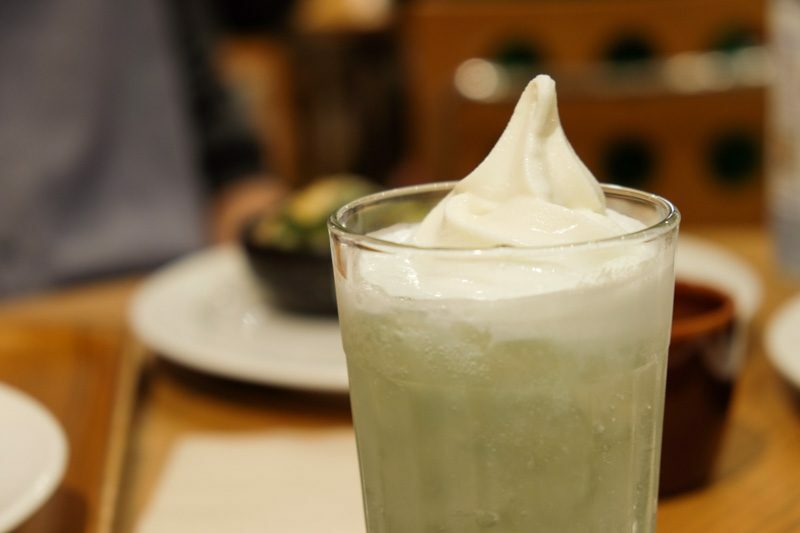 It is extremely milky, luscious and definitely not gelatinous at all. The burnt caramel adds a hint of bitterness that balances the sweetness of the dessert. Ah, how does one not grow fat in Osaka. Okay we are all going crazy over Gudetama because how could you not identify with a lazy egg? 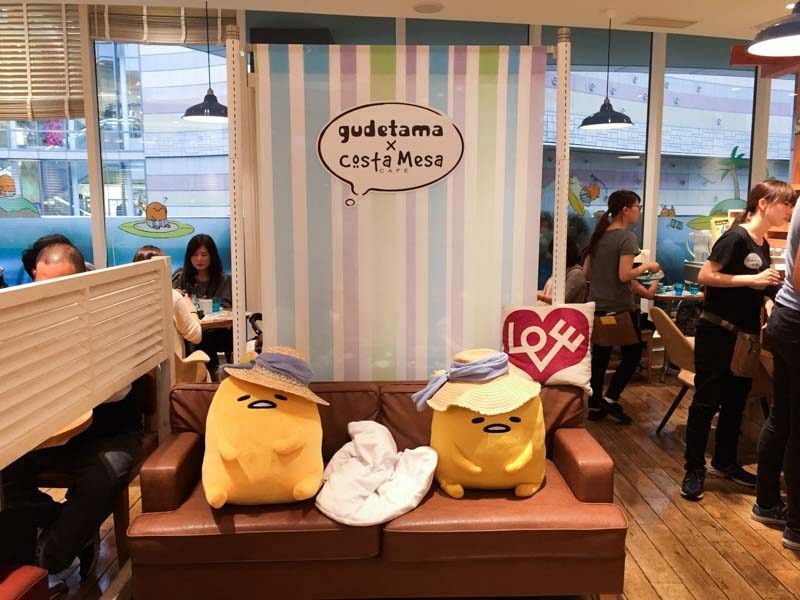 Japan is the land of kawaii and it comes at no surprise that they have a Gudetama themed cafe right in Namba Parks, Osaka. 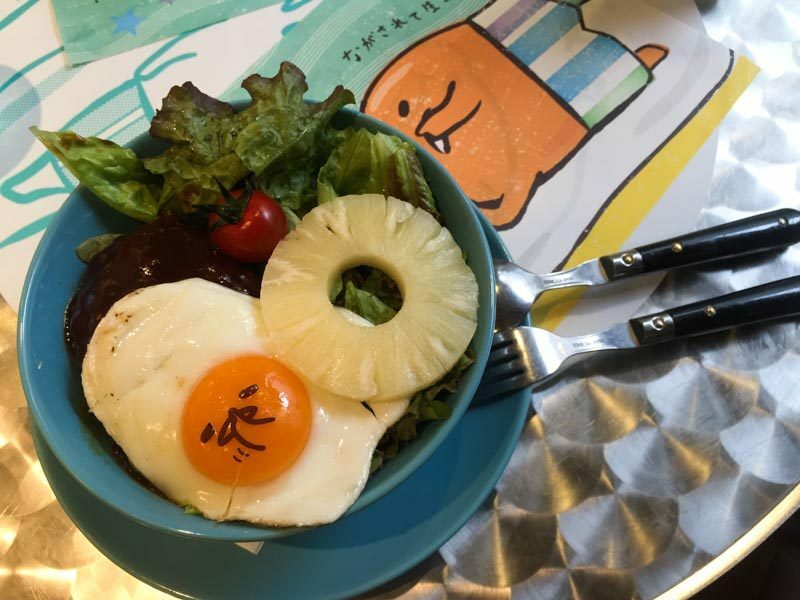 While the dishes look extremely cute, the food isn’t mind blowing. Here’s a glimpse of it. Basically, just think of a normal burger patty, nothing too magnificent, paired with pineapples and rice, slathered with demi glace sauce. But the cute print on the egg deserves some attention. 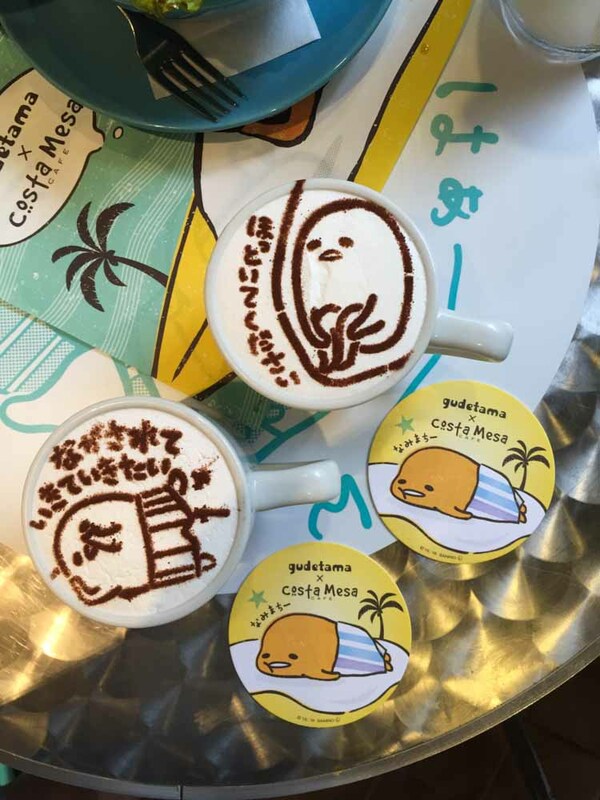 Pretty decent coffee right there, piled with cute foam and gudetama, ahhhh. Fresh fruits, yoghurt and granola, that’s what it is. 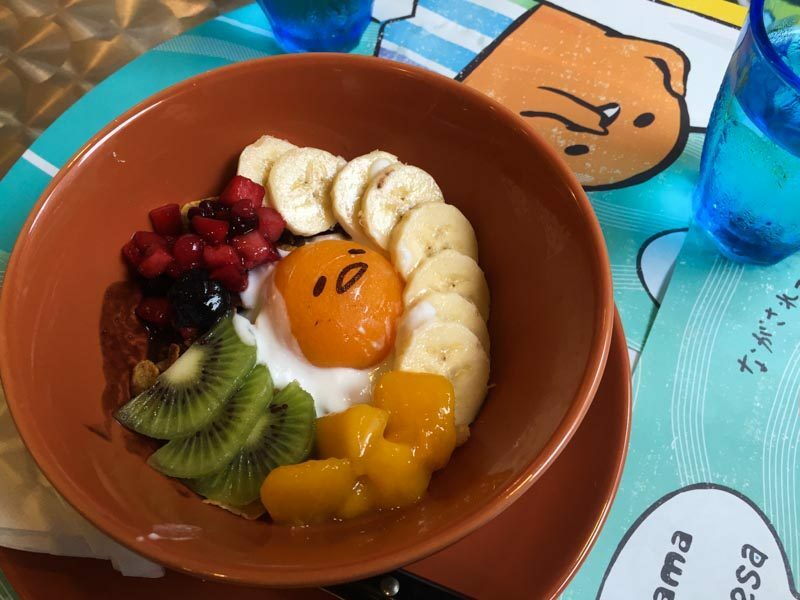 One can replicate this at home, except for the gudetama print. Ah parfait, all the ice cream goodness and cuteness. 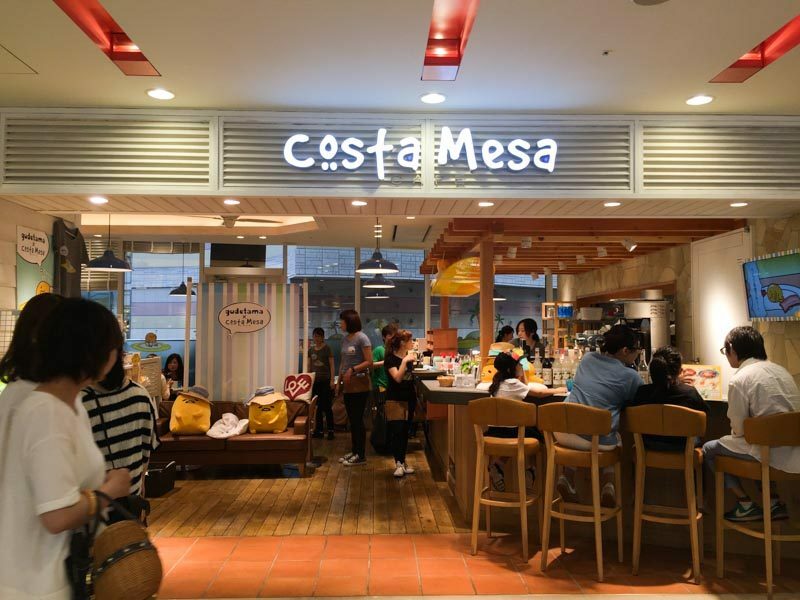 A joint collaboration with Costa Mesa on the fourth floor of Namba Parks, is the cute cafe that serves brunch food with Gudetama all over it. It is extra cute and all these kawaii-ness is worth the cheap thrill really. 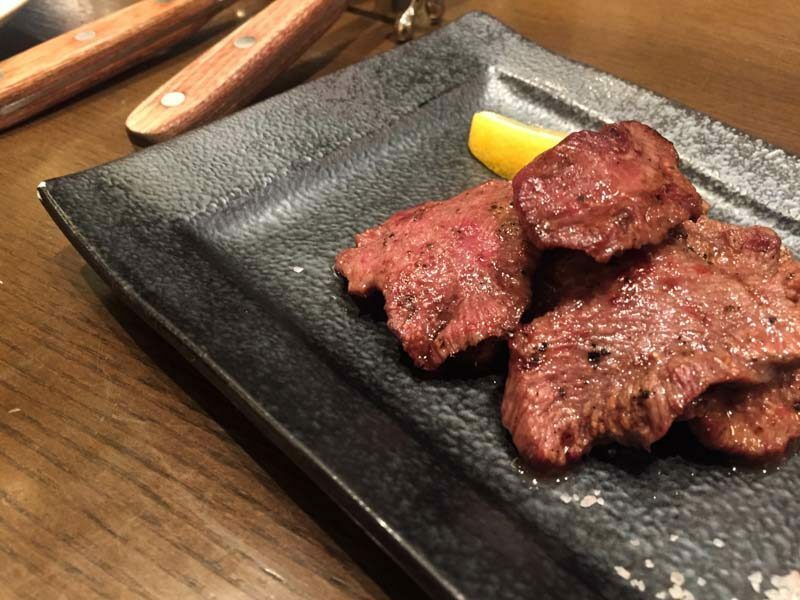 Not far from Daimaru lies Roman Tei, a humble stall that is beef centric. If you happen to be around on the 29th of each month, head down for a meal and participate in their competition where you can try to cut a slab of meat, and if its within a certain range, you get to have it realllllllly cheap. 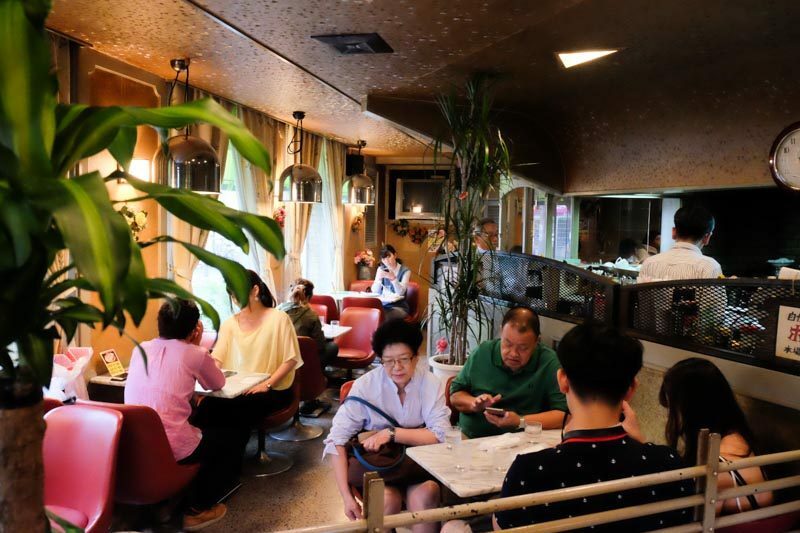 Complete with wood and concrete, Roman Tei boasts of a warm interior and limited seatings, remember to make reservations or head down earlier to grab a spot. Beef Tongue. Very chewy, these thinly sliced babies are further enhanced when paired with their himalayan pink sea salt. Don’t be taunted by the fact that they are tongue, go on have a try and thank me later. You surely will. Moriawase. Get a platter of beef sashimi, it is extremely rich and intense, there’s no other way I’d have it. Beef portion for 3-4. 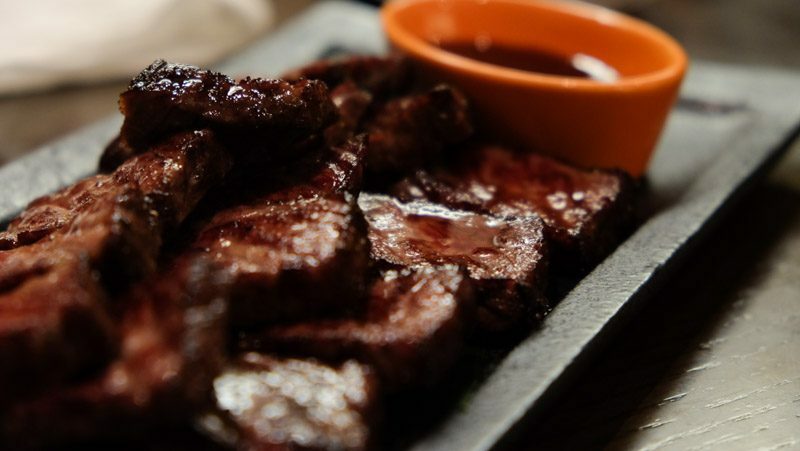 Opt for their super black doneness, which basically means that the beef will be charcoal grilled till its crisp and super black on the outside, while the inside remains tender and red. And dare I say, it’s probably one of the best beef I’ve ever tasted, and at such a ridiculously cheap price. 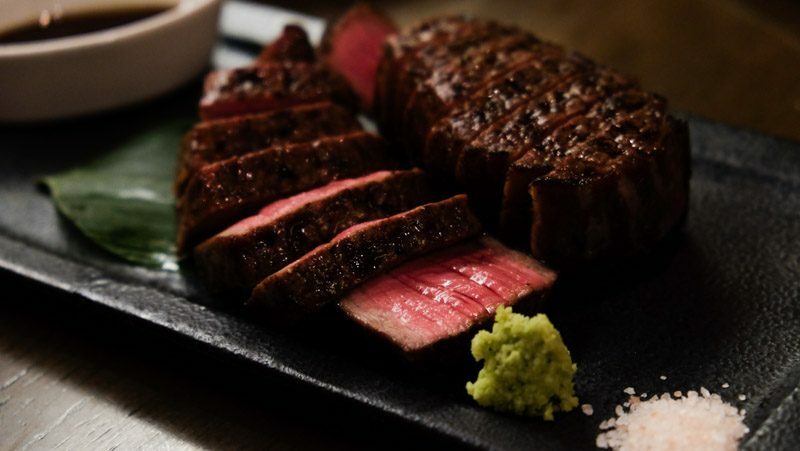 Extremely delectable, it is charred and aromatic on the outside, which combines well with the robust beef, leaving a lingering aftertaste. Trust the good people in the stall, they will teach you which parts to cut thin, which has to be thicker in slices, so as to maximise the taste of each cut. Learn if the fatty slices should go with salt or wasabi. Mmhm, moo. Juicy and seared so well, I’m having withdrawal symptoms right now. 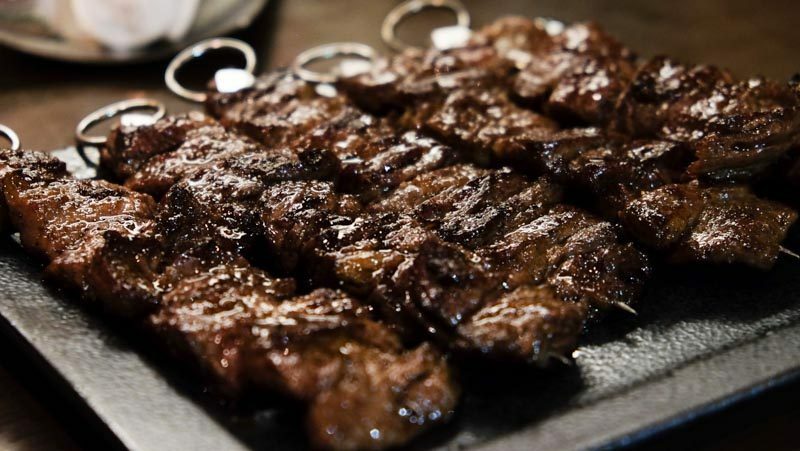 Beef skewers. 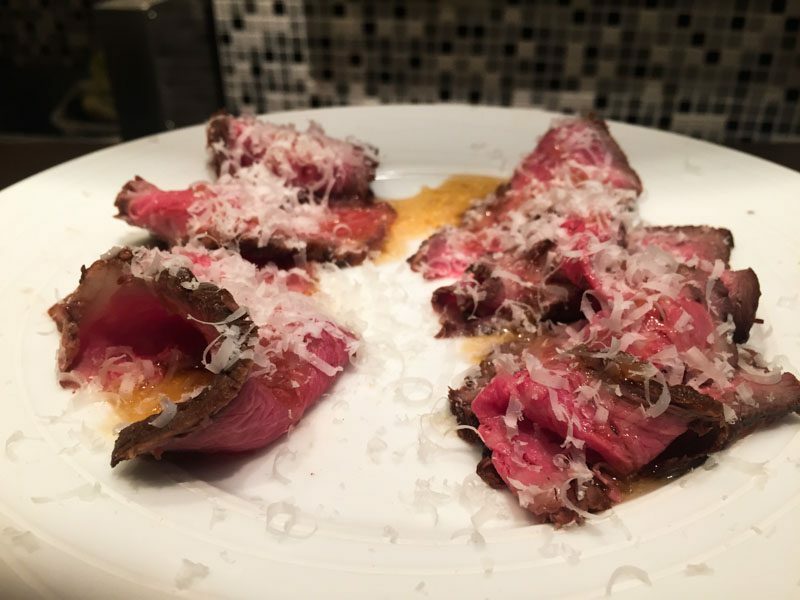 Chunks of seared beef alternating between luscious fats, a perfect combination of charred fragrance and deliquescing goodness. Just plain amazing. 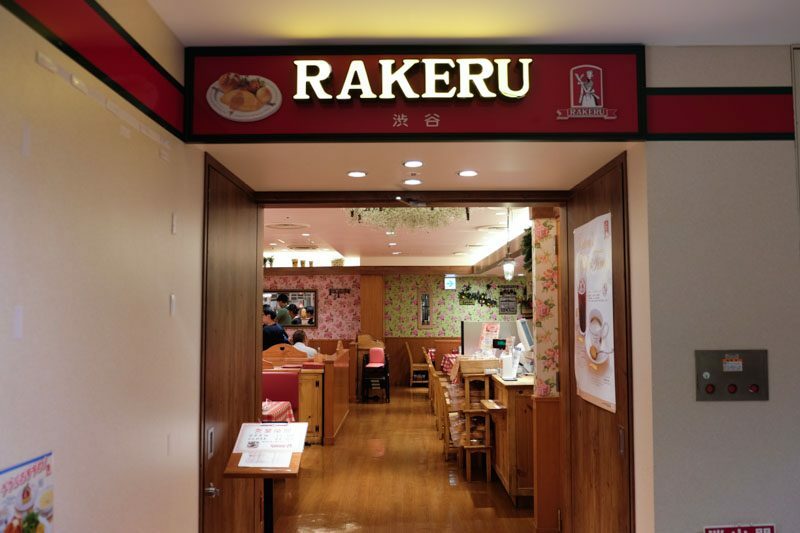 Rakeru is almost everywhere, I know. 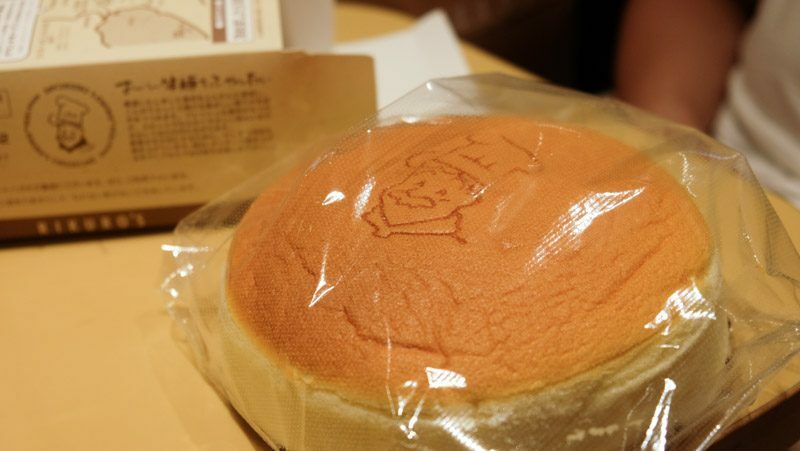 But their charming decor and absolutely drool-worthy omurice has warrant it a mention on this list. 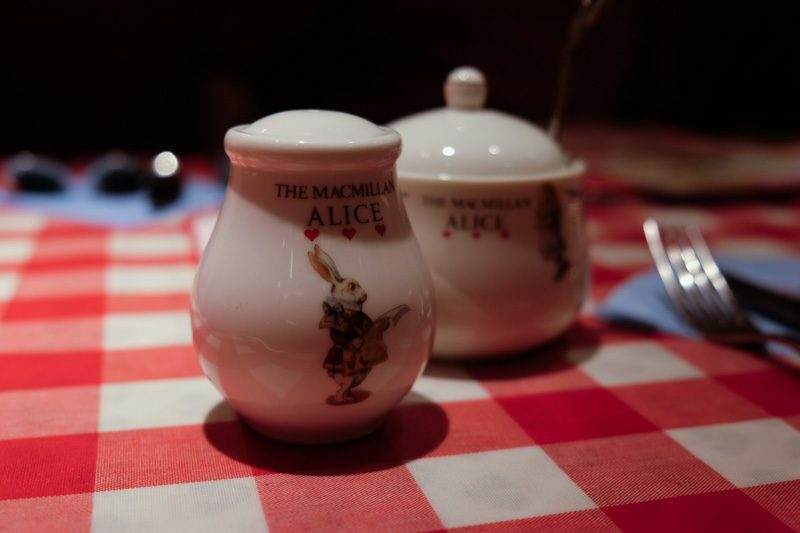 Think Alice In Wonderland themed and filled with rustic charm and that’s exactly what to expect at Rakeru, Namba branch. 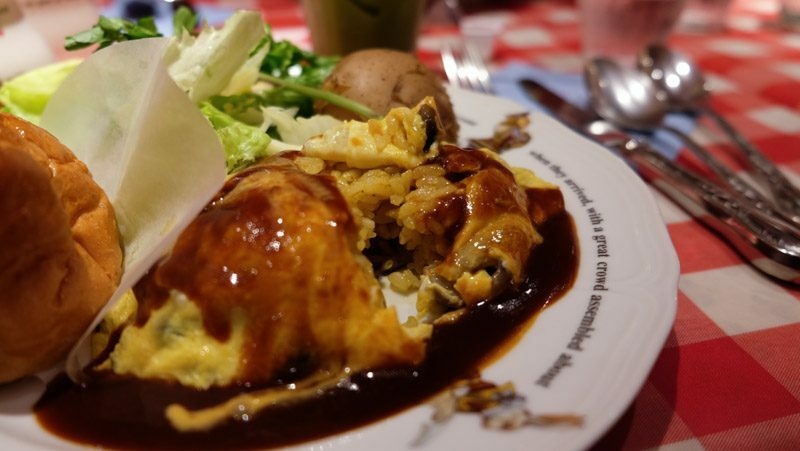 Mushroom and cheese omu rice with demi glace sauce (980 yen). When I had my first bite into the omurice, I was certain I fell in love. The egg is runny and luscious on the inside, combines well with the sauce, which didn’t drown out the other taste. 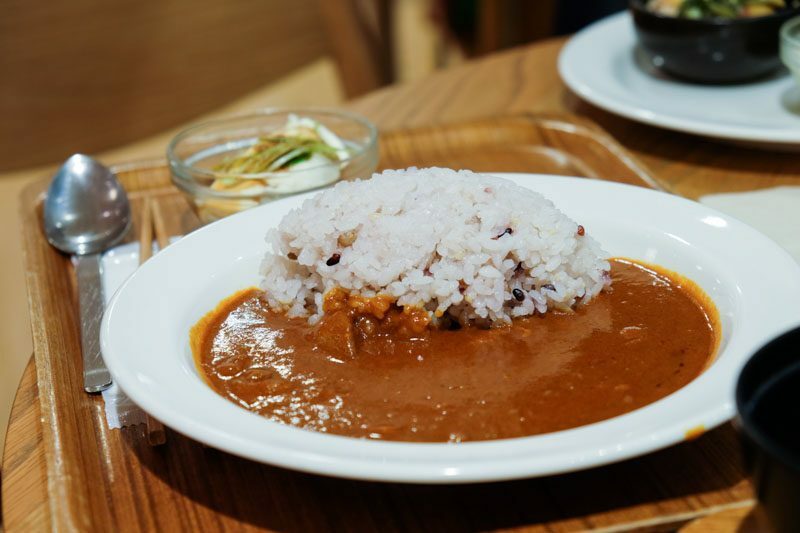 The curry rice within further enhances the layers of flavours, giving an extra savoury dish with a hint of sweetness. Let’s not forget about the mushrooms and cheese, a combination that is built to last. Also, their bread is exceptionally fluffy and pillowy, with a buttery centre that makes it so irresistable. Psst, you can buy home a pack of their buns if you absolutely love it. Gomaya is God’s gift to mankind, really. Quintessentially Japan-esy, Gomaya literally translates to Sesame House, so you now know what they hold in store. 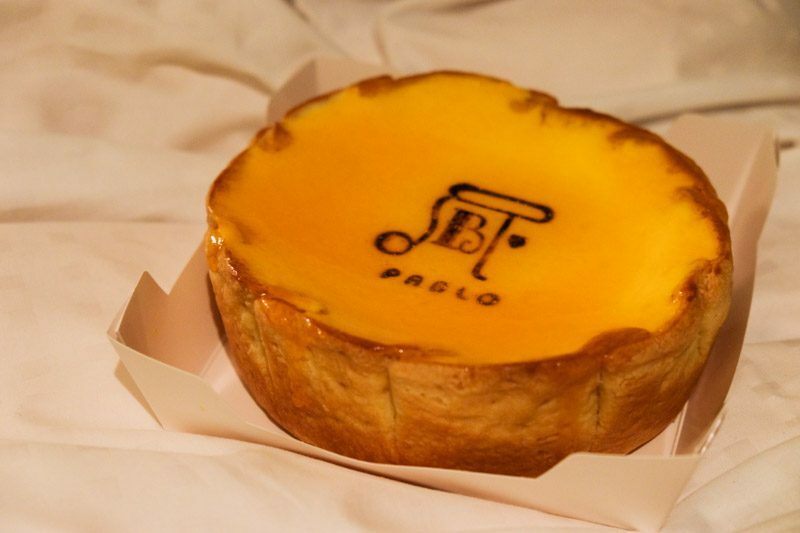 Situated on the 8th floor of Takashimaya is this gem that you definitely have to try. Set Lunch of Black Sesame Soba and Chirashi Don (1780 yen). 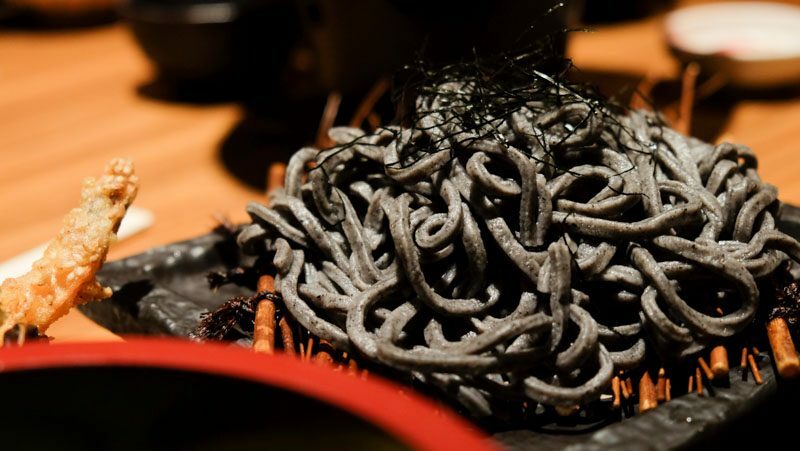 A shout out to the black sesame cold soba that was extremely fragrant, chewy and delicious. It has captured my heart. Every dish or set lunches are infused with sesame, making it more fragrant. 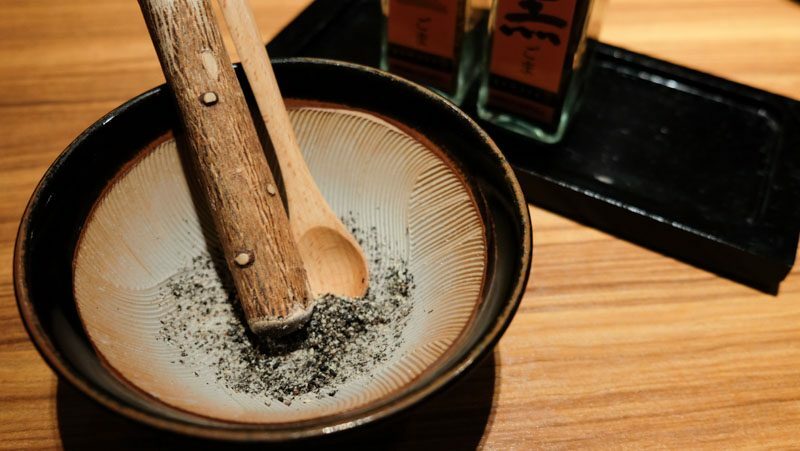 They have a bottle of white and black sesame mixed with salt, where you can ground your own and slather more sesame unto your dish. At some point I was literally pouring the black sesame onto all my dishes, and yes of course we bought a takeaway bottle, which I also added to my black sesame ice cream. While I’d love to try all the street food in Osaka, it is humanely impossible unless I spend a good year there. Here’s two stalls that I tried and you should too. 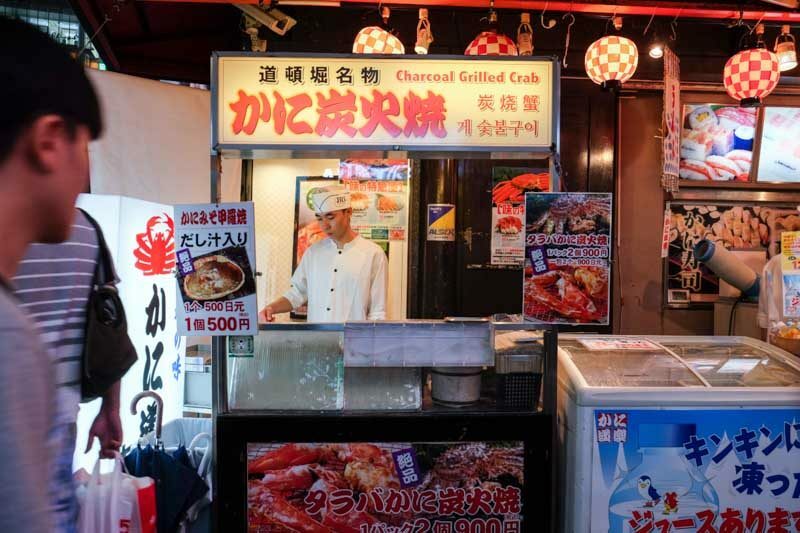 You can find both stalls along the Dotonburi outdoor stretch. 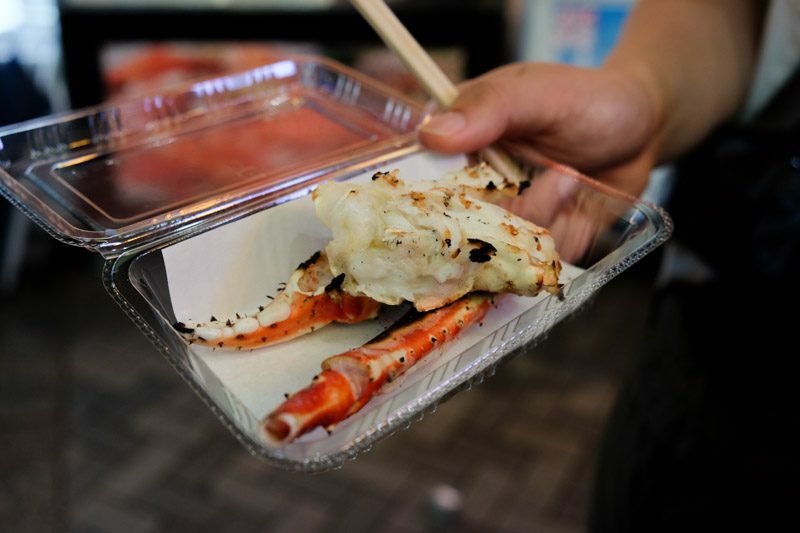 2 pieces for 900 yen and you can vividly taste the nicely charred flavour in the flesh of the crab. It is sweet, aromatic and definitely fresh. Quite a damn steal I’d say. 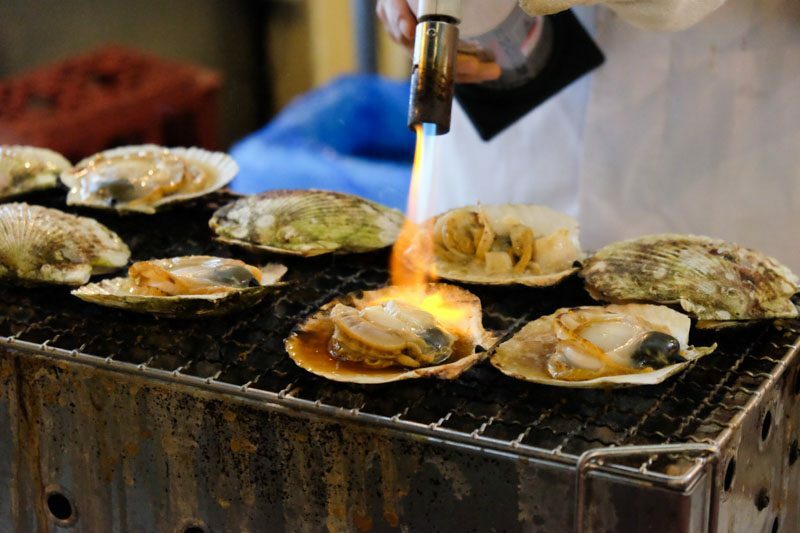 Seared on the spot, the scallops (500 yen) are plump. 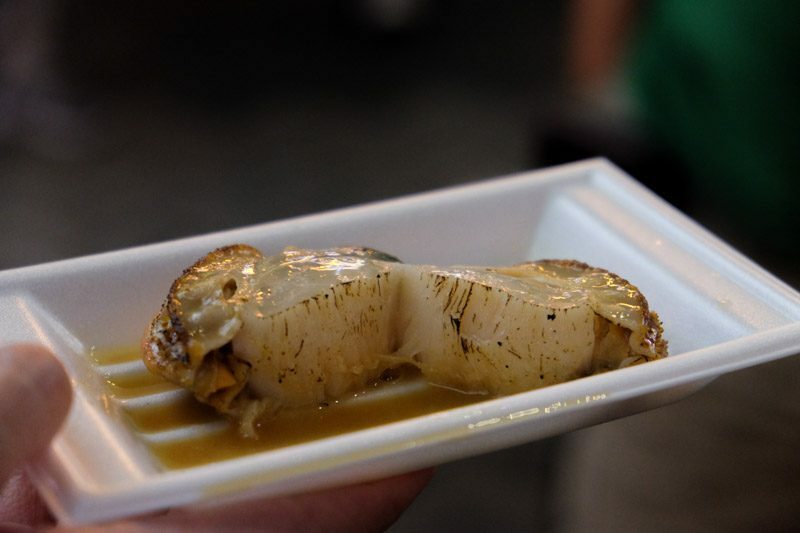 It is sprinkled with a dash of lemon juice and butter which makes it all the more decadently enjoyable and refreshing to have with the seared aroma, while retaining the briny seafood goodness. Here’s moving onto another area, Shinsekai. This area used to be a new and modern chic district before the war, and now, it retains its old charm, though not as new nor chic anymore. It is modelled after NYC and Paris, as shown by their Tennoji tower that bears resemblance to the Eiffel Tower. Extremely characteristic of itself, there are tons of cute cafes and kushikatsu places. 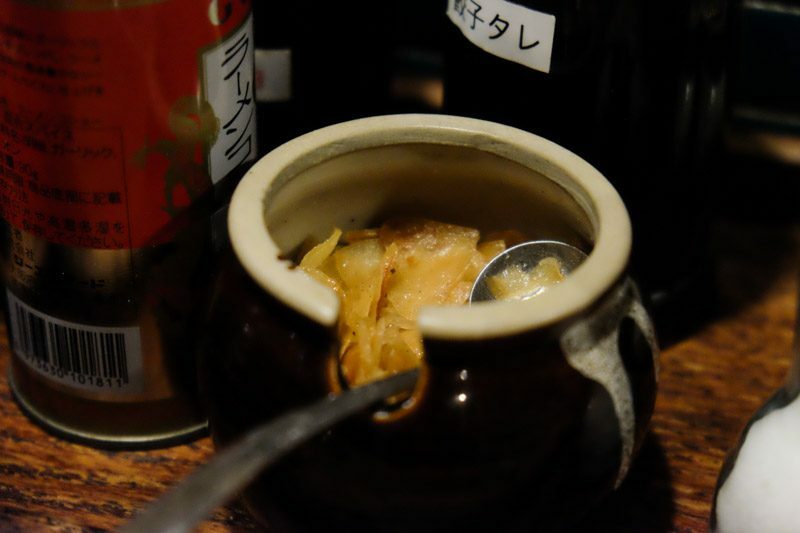 Here, you can also find a whole stretch of izakayas that are small and cosy, which are very localised. You can also play pachinko, old school pinball, mahjong and old school street fighter arcade machines. Ah the nostalgia. They are made fresh so you might have to wait for quite a bit, but it is definitely worth your time. Super fluffy, the homemade batter is slightly sweet on its own, not like the usual bland ones. 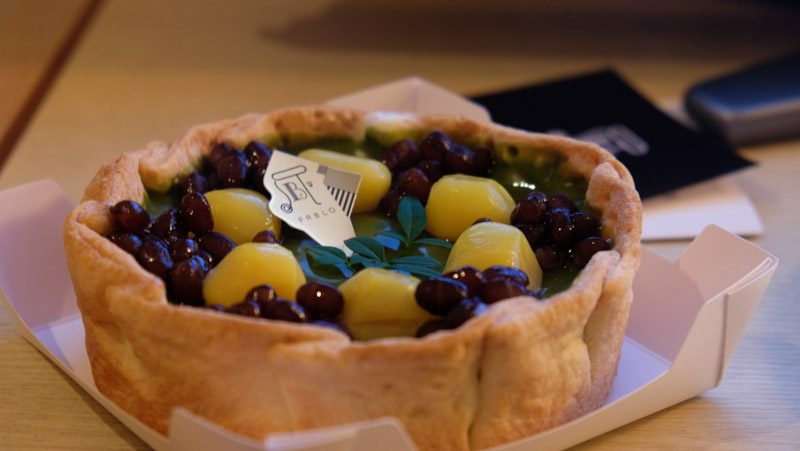 It pairs well with the red bean, to give a well balanced dessert. Decked in a super retro and quaint interior, I definitely relish in the decor and wished there were more places like these in Singapore. 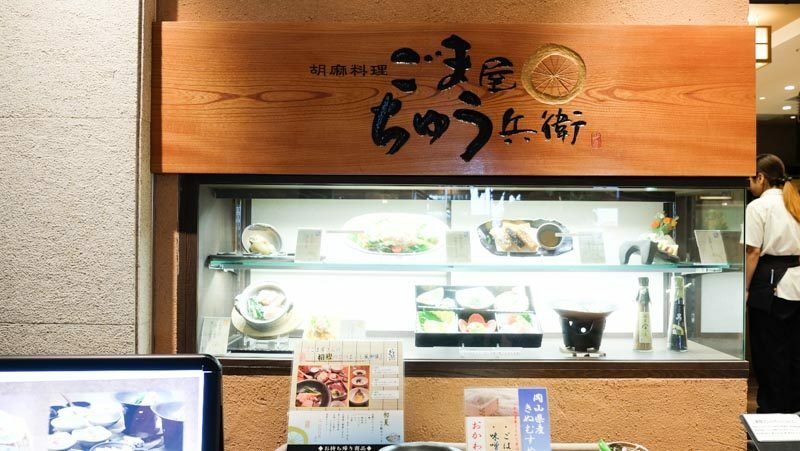 It is helmed by ojisans (uncles) and the menu is handwritten in Japanese. 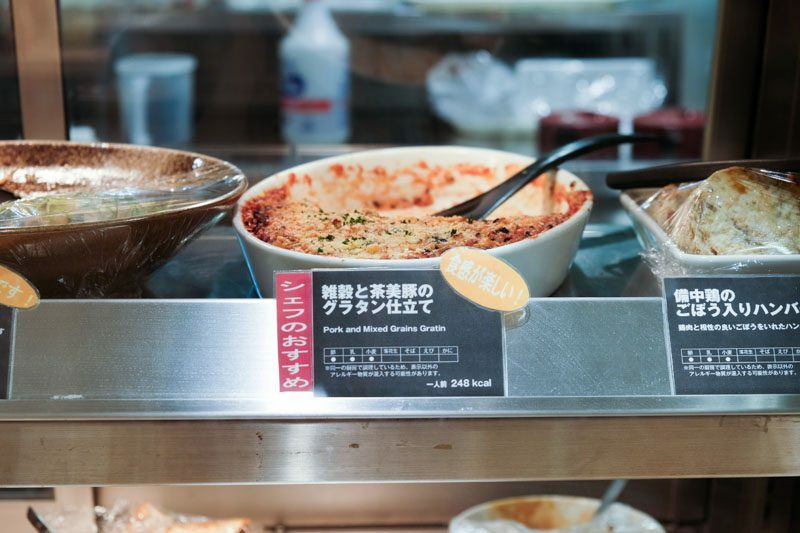 While they barely speak English at all, there are artificial models of the food they serve that you can point to. Moving onto the rich in heritage 16th century Osaka Palace that is surrounded by moats and gardens, there are tons of stalls and push carts around. 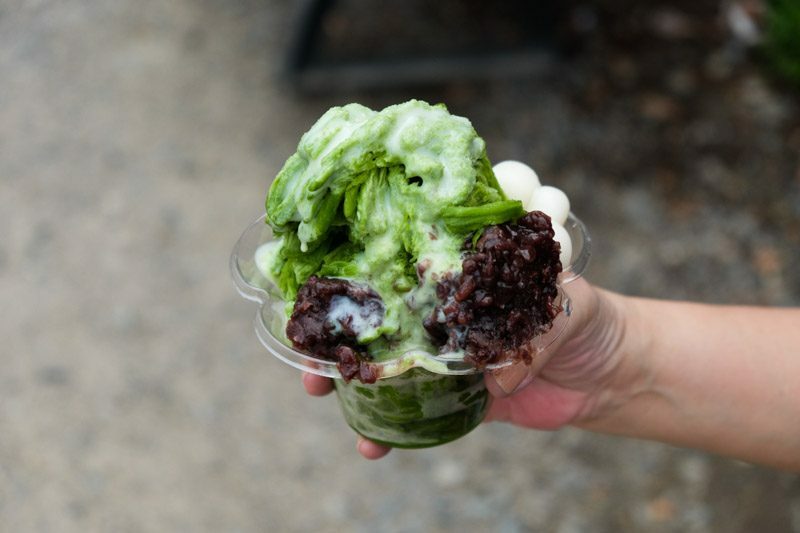 Head for the shaved ice if you’re there during Summer, or indulge in takoyaki and soft serves. Either way, you’ll be satisfied. On your way up to the palace you’ll be tempted to get shaved ice at the first cart, but trudge on for a bit more and you’ll find more choices at lower prices (500 Yen) as compared to the original 1200 Yen. While the former is cheaper, I haven’t tried it and I can only vouch for the latter’s quality. 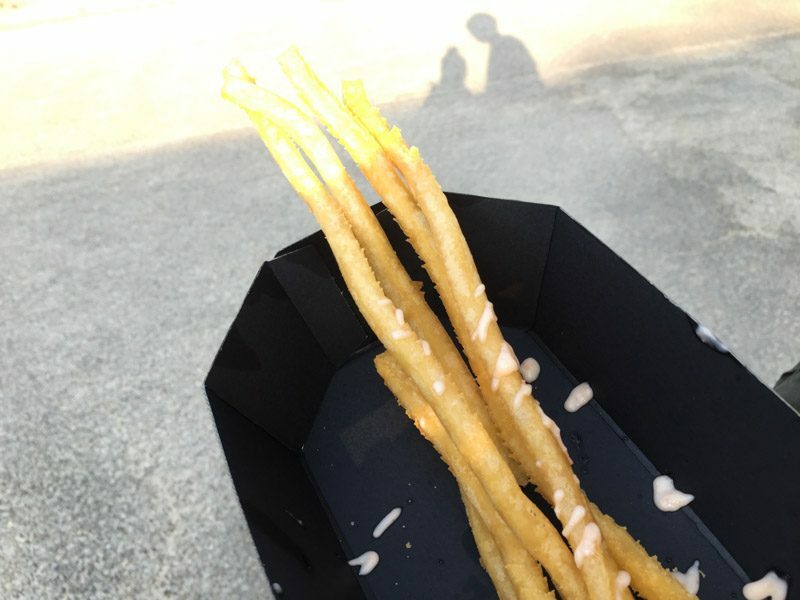 And get yourself a serving of really long fries topped with mentaiko (800 Yen). It is fragrant, crisp and definitely savoury. 2 cold deli and 1 hot deli (850 yen). Finally got a chance to try the Muji cafe in Japan, you bet I was super excited. I did not have any idea what I was getting into but I thought, if it’s a popular deli, it must be something delicious. It turned out to be chicken gizzards but I really didn’t mind it at all, think creamy and soft mash. Oh this was really the deal breaker for Muji cafe in Japan as opposed to the one in Singapore. The one back home is extremely limited, serving only the basics of deli and the not-so-extensive drinks list. 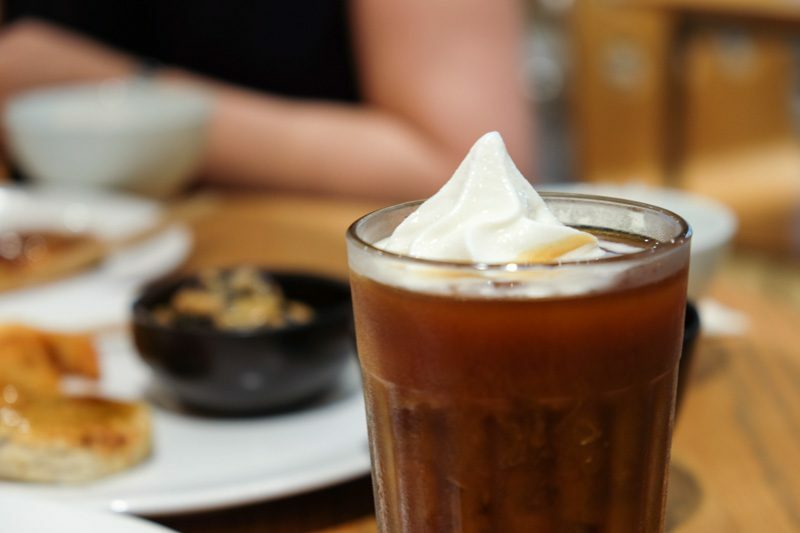 In Osaka, the deli serves coffee float (500 yen) and soda cream (550 yen). Ah, where art thou yummy things. 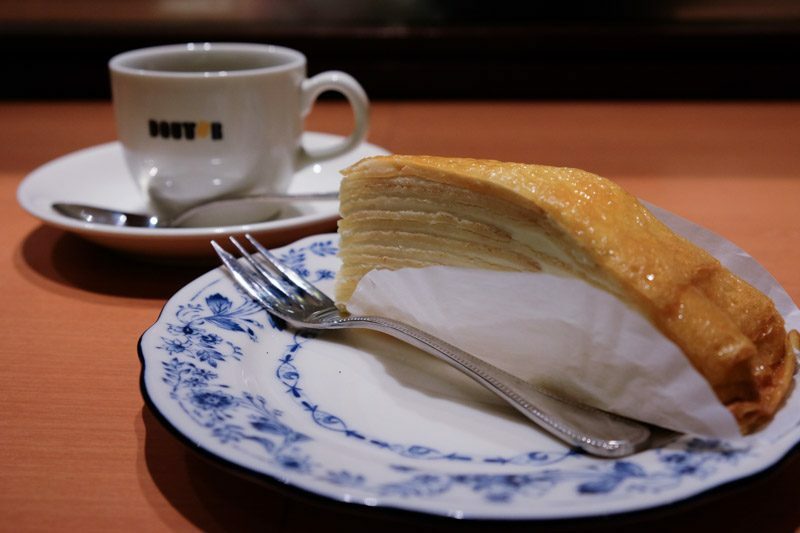 Mille Crepe Cake (360 yen). Mmhm, super creamy and milky while remaining incredibly light. 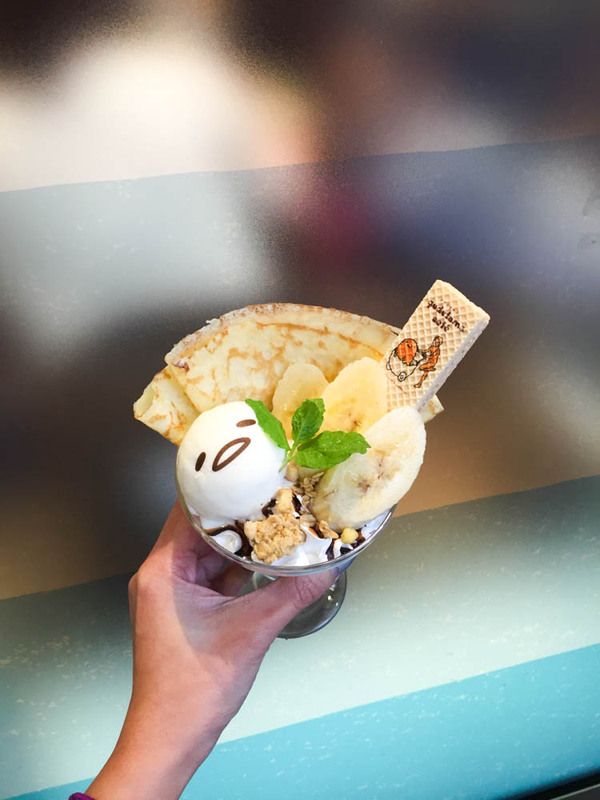 The layers of crepe are fragrant with a distinct aroma from the eggs, both flavours combine well and it’s no wonder the stall in Singapore has their mille crepe cake sold out asap.